The Fountain of San Stefano del Cacco is simply a sarcophagus from the Roman Imperial era fed by two rosettes in a wall. 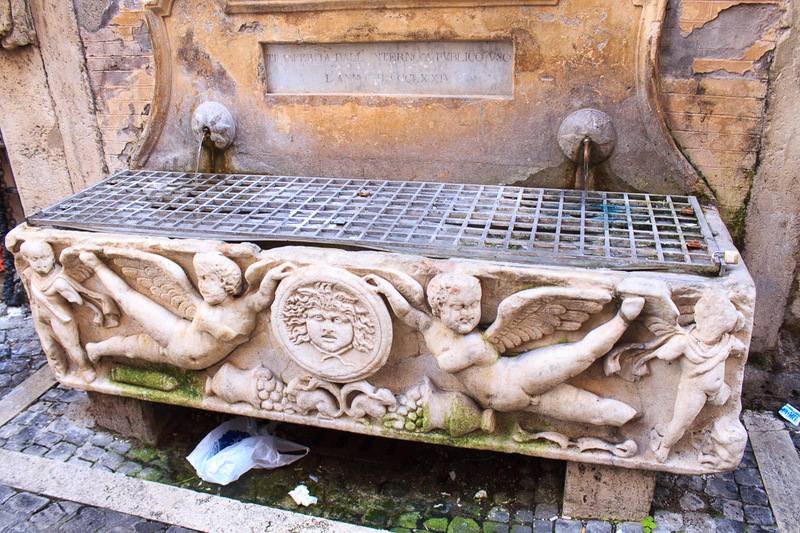 It might just be the oldest fountain in Rome, since it is made exclusively of something from the Imperial era. The inscription above the fountain translates as "transferred from internal to public use in the year 1874", telling when the sarcophagus was donated to the city of Rome. The sarcophagus is finely carved in low relief with the image of two angels in flight with spread wings supporting a medallion engraved with the head of a jellyfish under which two cornucopias spill their contents. Winged cherubs are carved on the corners of the coffin. See all Fountain of San Stefano del Cacco photos.